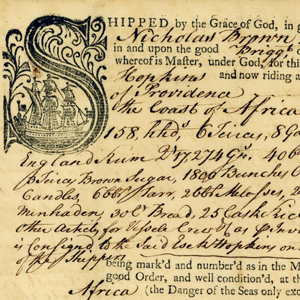 An archive of a wide array of historical documents, from the records of slaving voyages to student commencement orations, digitized in support of the work of the University Steering Committee on Slavery and Justice. The collection contains over one hundred and fifty historical documents, some six hundred manuscript pages in all, as well as introductory headnotes, bibliographic information, and technical data. Many of the documents have been transcribed, as part of an ongoing project. The original documents can be found in the John Carter Brown Library at Brown University, the Rhode Island Historical Society Library, and the Brown University Archives.